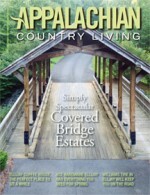 It’s no secret that there are gorgeous, scenic views around almost any bend in the north Georgia Mountains. Amazing vistas, towering and flowering trees, mountain-fed streams, cascading waterfalls and lovely wildflowers await those who choose to get out and experience nature’s wonder. Each season the Benton MacKaye Trail offers its own unique opportunity for hikers to enjoy the diverse scenery of the mountains. In winter there are many mild hiking days, and with the leaves gone from the trees, one can enjoy the wide-sweeping panoramas and spectacular long-range views. Spring and early summer are peak times to see an abundance of colorful wildflowers, rhododendrons and flowering trees. And only by hiking in the fall, can you witness up close and personal the vivid red, yellow and gold leaves that adorn the autumn trees. But how do you learn about these places? The Benton MacKaye Trail Association (BMTA), founded in 1980 is here to help. Not only does the BMTA maintain the trails, offer trail guides and maps for those wanting to explore the BMT on their own, but organized hikes are available as well. The best way to optimize your experience and feel comfortable being in the woods is to hike the trails with other like-minded people. If you ever wanted to start exploring the beautiful mountains in this area, join one of the monthly group hikes. 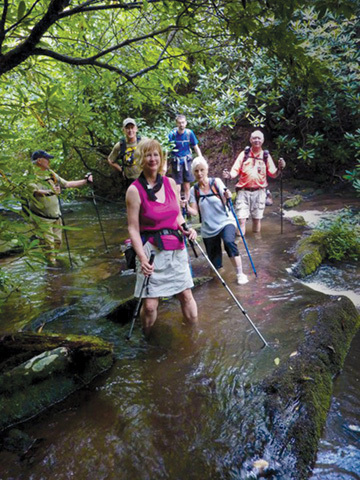 Most of the hikes are considered easy to moderate and upcoming hikes are listed on the website BMTA Activities Calendar page. The BMT more closely follows Benton MacKaye’s original proposed routing for the southern portion of the Appalachian Trail and is considered a more natural and wild trail, with less foot traffic than the Appalachian Trail. On many sections of the trail, one may hike all day or even several days and never see another hiker. Those that hike the BMT say they like the more remote and primitive feel and the challenge of hiking in these conditions. That said, persons venturing out on remote sections of the trail should be experienced hikers and carry maps and trail guides describing the sections of the trail being traveled. Regulations require that no blazes be allowed in the wilderness areas. BMTA, a nonprofit 501c3 all-volunteer organization dedicated to the maintenance and preservation on the Benton MacKaye Trail. The members’ tireless efforts are not only appreciated by those that use the trail, but the Association has been endorsed by the National Park Service and three National Forests. Volunteers are always in high demand as the needed work is constant. They have been fortunate to have Boy Scouts, Youth Conservation Corps, Trout Unlimited and other organizations supplement their member volunteers. With their help, the BMTA has been able to accelerate completion of many projects over the years. Maintaining the trail to ensure that it is sustainable, ecologically sound and consistently in the best possible shape to accommodate those that seek to enjoy hiking its trails takes constant vigilance and hard work. The Association relies on the generosity of volunteers to keep the trails clear of fallen trees and other debris, rerouting trails as necessary and rebuilding sections of the trail as conditions dictate. If you are a hiker or outdoorsperson who would like to give something back to the wilderness resource, one of the best ways to contribute is by attending the monthly work trips. It’s not all work and can be very rewarding. Another option is becoming a Section Maintainer by adopting a length of trail. This requires a higher level of commitment – approximately 12 hours work per year per mile. Yet another way is available to any who are willing to tackle high-priority items, such as large blow-downs, by joining the Quick-Response Crew. Becoming a member, assisting with administrative needs, serving on the BMTA board of directors, and/or making a financial donation are all ways in which you can lend a hand. It’s easy to join and when you keep your membership current, you’re helping us maintain and improve the trail. Lastly, donations can be targeted specifically toward trail maintenance. The BMTA heartily welcomes your help.